Today we had an exclusive interview with the head of Design and Technology at LGS about an electric smart car he is trying out. This car is a new innovation by Smart called the Electric Drive. 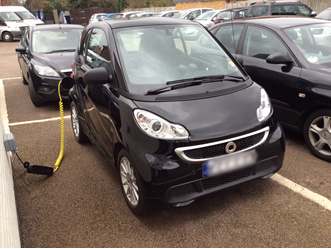 It looks just like a normal smart car from the outside, but is it is powered by electric. It costs £25,000, however the government pays you £5000 back when you purchase it. The batteries have to be rented, but they are replaced for free if anything happens to them. Compared to his old car which cost £80 a day to run, this new car only costs 40p a day at 1p per a mile, making it extremely cheap to run. There is no road tax on it, and it could potentially not need servicing-different companies are saying different things about it, but Vauxhall are saying they just need to check it and the battery over every year. The Electric car does 0-60 in just 7 seconds and has a top speed of 80mph. While sitting in the car, there are a few signs it does not run on normal fuel such as a battery percentage dial, and the silence when the car is started, as there is no loud engine noises like in a normal car. It takes 7 hours to charge via a standard 3 pin plug, but takes half that time with the provided charger, however this is harder to find and costs more to install. Smart claim that it has a 90 mile range on one charge, however the most the head of DT has seen is 75, and he says taking it to 90 would ruin the battery. Cleverly, it also has regenerative charging, which uses the energy from braking to charge the engine. There are a few other electric cars on the market such as the Nissan Leaf and the Renault Twizy. Are electric cars the future of transport? We think so. 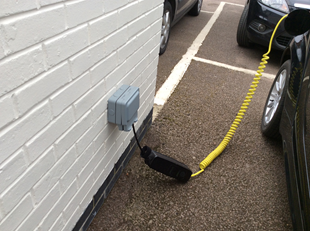 The car charges via a normal plug socket. 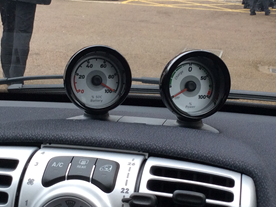 Instead of a fuel gauge, it has a battery percentage gauge.